latest sp-eed test for ultimate pack with speed pack should be around 100mbits????? I have the $150 optus supersonic cable broadband homephone bundle. 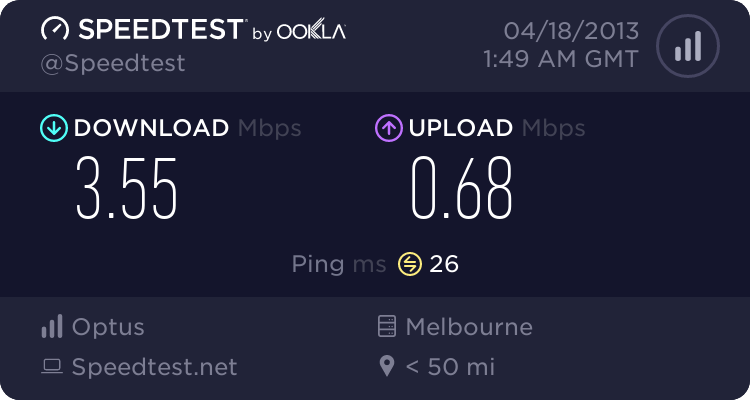 The promised "supersonic speeds" have not been achieved and my current download speed is 2014kbps and the link to the speed test: http://speedtest.ookla.com/result/2081933184.png . I have tried to resart the modem many times and it has no effect. I have also checked all cables and they are all connected properly. I have also checked my usage and right now it stands at 3%. 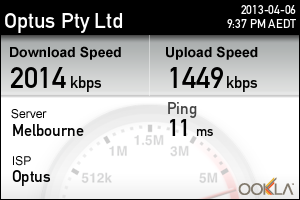 Unless this problem can be resolved I will be cancelling my optus account and move to rival services. For the last 2 months its been like this, yet we've only been connected for 3 months now. The high latency ping for online games and downloading is atrocious. i have cable yet get dial up speeds. thank you optus for such a great marketing pitch. it sucked us all in. step up customers. class action is the only way. 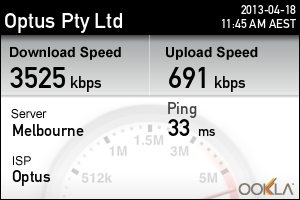 Hi yanbrown, the ping and upload definitely look fine, but the download may be a bit lower than we would expect. Are you seeing these speeds all of the time, or is it happening mainly at certain times of the day? Have you had a chance to speak to our tech team on 131344 so that they can have a closer look at your connection? If these issues are happening only at certain times, it may be a result of congestion at your local exchange, but if it's all the time then it could be a modem or line fault for example. 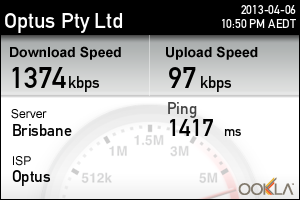 Hey!I've just changed my provider from TPG to Optus recently. I was so excited and thought could have a much faster internet speed. In the end, it dissapoints me, not only it's not any faster than TPG but it's SLOWER!! Just is there anything that you can do to enhance it? ?It just doesn't make sense when I pay more but having slower speed! I've been a customer for about 10 years as well, and my speeds have gone from 50ms peer to peer to about 300ms at night time in the past 2 weeks.. It seems to be clearly an issue with conjestion as it only happens at night time at peak hours. I also work at home during the day time, and the pings are very good at 50ms.. all day.. until around 5:30pm.. and you guessed it everyones home (not my house, I live with only one other person who doesn't use the internet). Note this also only started happening after the day the internet was out for half a day.... (because they had problems with their exchange). Maybe they just rerouted everything to another already over populated exchange,. I've been on the phone to tech support/ twice and both of the times they didn't seem to know what they were doing. They kept ignoring my tracert results and kept reffering to speed test. After stating I hosted alot meetings and games, and it was not the server lag... it was peer to peer... they advised they would put me through to the hosting department. Obviously the hosting department wouldn't help me, as I do not host a website with optus. Too bad I do not have much option to move carriers, but I will be moving as soon as the NBN comes. From what you're describig strat29 it does sound like your local exchage is possibly experiencing some peak time congestion where speeds are lowering during these times when there's more traffic on the network. Do you have any Problem Report numbers handy that I can take a look into for you? If not, then feel free to shoot me a Private Message including your Optus Internet Username so I can access your service and run some tests for you. That's fine Ryan, on the 3rd occasion I spoke to someone who knew a bit more.. It was confirmed as congestion and they have advised it will be 1 more month till they do some upgrades to improve the congestion.. I guess all I can do is wait. Happy atleast I get some acknowledgement it is not my line.